Kitchen Connection - Kitchen Connection Goes to: Rwanda! Kitchen Connection Goes to: Rwanda! Fun Facts: Agriculture and cattle is the traditional way of life in Rwanda. The culture of Rwanda is a very diversified and it has a unified state since pre-colonial times unlike many countries in Africa. It not only includes the population of Rwanda but also Kinyarwanda speaking people in the neighboring states particularly Uganda and Congo. There are 3 main ethnic groups in the Rwandan culture namely Hutu, Tusi and the Twa and these are based on perceptions of historical originals and not cultural differences. All the three speak the same language, live interspersed throughout the same territory and also practice the same religions. Rwandans living in Uganda and Congo include refugees as well as Kinyarwanda speakers who lived outside Rwanda for generations and all these usually maintain a strong identification with the Rwandan national state. *Indigenous communities and their dishes: Hutus, Tutsis and Twa (Batwa). Populations of these groups have been estimated previously to be: Hutus (84 per cent), Tutsis (15 per cent) and Twa (Batwa) 33,000, amounting to around 0.3 per cent. Information about the animals living in Rwanda is brought to you by "List of countries of the world", your first stop in discovering all countries and animals of the world. Using this space to Connect you with the world, your world! Intended Users. The Site is intended for use by individuals over the age of eighteen (18) years old. Users of the Site under the age of eighteen (18) require the assistance of a parent or guardian. Disclosure: Users of our Connections feature - live cooking or live topic classes - are only to be of the minimum adult age in every country, that is 18 in the United States, and that which is according to the respective laws of the user's country of citizenship or residence. We are not liable for any harm that is done to our users and/or their property before, during, and after these Connections. Copyright and Intellectual Property Policy. All names, logos, service marks, and trademarks appearing in this Site, including the trademarks, service marks, brand identities, characters, trade names, graphics, designs, copyrights, trade dress, and all other intellectual property (“Content”), except as otherwise noted, are protected intellectual property of, or used with permission or under license by, The Kitchen Connection, its Clients, and its Affiliates. This includes the entire Content of the Site, copyrighted and protected as a collective work. Your use of the Site is limited to personal and non-commercial use only unless other uses are granted expressly to you. You may not copy, distribute, modify, transmit, reuse, re-post, or otherwise display the Site Content for public or commercial purposes without The Kitchen Connection’s written permission for such use of Content. You may not harvest or otherwise collect information about others, take any action that imposes an unreasonably large load on the Site’s servers, violate the security of the Site, or engage in any other conduct that exposes us or any of our users to any liability or potential harm. Reviews and the aggregation thereof remain on the platform despite the deletion of any user's profile. It is The Kitchen Connection’s policy, in appropriate circumstances and at its discretion, to disable and/or terminate the accounts of users who may infringe or repeatedly infringe the copyrights or other intellectual property rights of The Kitchen Connection and/or others. Conditions of Sale and Payment Terms. To purchase any goods and/or services on the Site, You must be at least eighteen (18) years old or the applicable state age of majority. Refund policy — Kitchen Connection acts as an intermediary — when you schedule a class you and the host of the live cooking class enter into a contract. If the host for any reason breaches the contract, he/she can issue refunds directly through Paypal. However, funds dispersed to charitable organizations may not be refunded. Delivery. All orders placed on this Site are delivered via Google Hangouts. If Your order has an error, You must notify The Kitchen Connection within twenty-four (24) hours. Email contact@kitchenconnection.org within twenty-four (24) hours of the error and put in the subject line “Error”. Order Acceptance Policy. Your receipt of an electronic order confirmation or other form of order confirmation does not signify The Kitchen Connection’s acceptance of Your order, nor does it constitute confirmation of Kitchen’s offer to sell. The Kitchen Connection reserves the right at any time after receipt of Your order to accept or decline Your order for any reason. The Kitchen Connection further reserves the right any time after receipt of Your order, without prior notice to You and for any reason, to supply less than the quantity You ordered of any item. Your order will be deemed accepted by The Kitchen Connection upon its delivery of products or services that You have ordered. The Kitchen Connection may require additional verifications or information before accepting any order. No Responsibility to Sell Mispriced Products or Services. The Kitchen Connection shall have the right to refuse or cancel any orders placed for products and/or services listed at an incorrect price, rebate or refund, or containing any other incorrect information or typographical errors. The Kitchen Connection shall have the right to refuse or cancel any such orders whether or not the order has been confirmed and Your Credit Card or PayPal Account has been charged. If Your Credit Card or PayPal Account has already been charged for the purchase and Your order is canceled, The Kitchen Connection shall issue a credit to Your PayPal Account in the amount of the charge. Your Credit Card or PayPal Account policies will dictate when this amount is credited to Your Account. Modifications to Prices or Billing Terms. THE KITCHEN CONNECTION RESERVES THE RIGHT, AT ANY TIME, TO CHANGE ITS PRICES AND BILLING METHODS FOR PRODUCTS OR SERVICES SOLD, EFFECTIVE IMMEDIATELY UPON POSTING ON THE SITE OR BY E-MAIL DELIVERY TO YOU. DISCLAIMER OF WARRANTIES. By using the Site, You expressly agree that use of the Site is at Your sole risk. The Site is provided on an “AS IS” and “As Available” basis. Neither The Kitchen Connection nor its Associates warrant that use of the Site will be uninterrupted or error-free. Neither The Kitchen Connection nor its Associates warrant the accuracy, integrity, or completeness of the content provided on the Site or the products or services offered for sale on the Site. Further, The Kitchen Connection makes no representation that content provided on the Site is applicable to or appropriate for use in all locations or all Users. The Kitchen Connection and its Associates specifically disclaim all warranties, whether expressed or implied, including but not limited to warranties of title and merchantability or fitness for a particular purpose. No oral advice or written information given by The Kitchen Connection or its Associates shall create a warranty. Some states do not allow the exclusion or limitation of certain warranties, so the above limitation or exclusion may not apply to You. LIMITATION OF LIABILITY. Under no circumstances shall The Kitchen Connection or its Associates be liable for any direct, indirect, incidental, special or consequential damages that result from Your use of, or inability to use the Site, including but not limited to reliance by You on any information obtained from the Site that results in mistakes, omissions, interruptions, deletion or corruption of files, viruses, delays in operation or transmission, or any failure of performance. The foregoing Limitation of Liability shall apply in any action, whether in contract, tort, or any other claim, even if an authorized representative of The Kitchen Connection has been advised of or should have knowledge of the possibility of such damages. You hereby acknowledge that this paragraph shall apply to all content, merchandise and services available through the Site. Some states do not allow the exclusion or limitation of incidental or consequential damages, so the above limitation or exclusion may not apply to You. THE KITCHEN CONNECTION IS NOT RESPONSIBLE FOR ANY AND ALL HARM THAT ARISES FROM THE VIEWING OR RECEPTION OF ANY AND ALL USER MESSAGES. YOU AGREE TO HOLD THE KITCHEN CONNECTION FREE FROM ANY AND ALL LIABILITY IN TORT, CONTRACT, OR ANY OTHER LEGAL THEORY FOR ANY AND ALL HARM THAT ARISES FROM THE USE OF THE SITE AND THE VIEWING OF ANY AND ALL MESSAGES, OR FAILURE OF A MESSAGE, OR LACK OF MESSAGE. YOU AGREE TO HOLD THE KITCHEN CONNECTION FREE FROM ANY AND ALL DAMAGES ARISING FROM THE USE OF THE SITE OR THE FAILURE OF THE SITE. THE KITCHEN CONNECTION IS NOT RESPONSIBLE FOR ANY AND ALL HARM THAT ARISES FROM THE CONSUMPTION AND/OR USE OF RECIPES AND INSTRUCTIONS FROM A VIDEO CONFERENCE IN PREPARATION OF AND CREATION OF A MEAL. YOU AGREE TO HOLD THE KITCHEN CONNECTION FREE FROM ANY AND ALL LIABILITY IN TORT, CONTRACT, OR ANY OTHER LEGAL THEORY FOR ANY AND ALL HARM THAT ARISES FROM THE CONSUMPTION OF RECIPES AND MEALS AND/OR USE OF THE SERVICES THE KITCHEN CONNECTION SELLS. YOU AGREE TO HOLD THE KITCHEN CONNECTION FREE FROM ANY AND ALL DAMAGES ARISING FROM THE CONSUMPTION OF RECIPES AND MEALS AND/OR USE OF ANY SERVICES THE KITCHEN CONNECTION SELLS. Termination. The Kitchen Connection may terminate Your access to the Site at any time, for any reason, without notice, in its sole discretion. You are personally liable for all orders placed and charges incurred prior to termination. YOU AGREE THAT THE KITCHEN CONNECTION WILL NOT BE LIABLE TO YOU OR TO ANY THIRD PARTY FOR TERMINATION OF YOUR ACCESS TO THE SITE. The Kitchen Connection reserves the right to change, suspend, or discontinue any or all aspects of the Site at any time, without notice, in its sole discretion. If You become dissatisfied with the Site, Your only recourse is to immediately discontinue use of the Site. DISPUTE RESOLUTION, BINDING ARBITRATION. PLEASE READ THIS SECTION CAREFULLY. THROUGH USE OF THIS SITE YOU ARE GIVING UP RIGHTS THAT YOU MAY OTHERWISE HAVE. IT PROVIDES FOR RESOLUTION OF DISPUTES THAT YOU OR THE KITCHEN CONNECTION MAY HAVE WITH EACH OTHER THROUGH INDIVIDUAL ARBITRATION INSTEAD OF THROUGH COURT TRIALS, JURY TRIALS, OR CLASS ACTIONS. ARBITRATION IS FINAL AND BINDING AND SUBJECT TO LIMITED REVIEW BY A COURT. THIS ARBITRATION CLAUSE SHALL SURVIVE TERMINATION OF THIS AGREEMENT. This Section is intended to be interpreted broadly to encompass all disputes or claims arising out of this Agreement, or Your purchase, or use of any product or service from The Kitchen Connection. ANY DISPUTE OR CLAIM MADE BY YOU AGAINST THE KITCHEN CONNECTION ARISING OUT OF OR RELATING TO THIS AGREEMENT, OR YOUR PURCHASE OR USE OF ANY THE KITCHEN CONNECTION SERVICE OR PRODUCT REGARDLESS OF WHETHER SUCH DISPUTE OR CLAIM IS BASED IN CONTRACT, TORT, STATUTE, FRAUD, MISREPRESENTATION, OR ANY OTHER LEGAL THEORY (TOGETHER, A “DISPUTE”) WILL BE RESOLVED BY INFORMAL NEGOTIATIONS OR THROUGH BINDING ARBITRATION, AS DESCRIBED BELOW. Informal Negotiations. To expedite resolution and control the cost of a Dispute, you and The Kitchen Connection agree to first attempt to resolve a Dispute informally for at least thirty (30) days before initiating any arbitration. Such Informal Negotiations will commence upon written notice from one party to the other. You must send Your notice to contact@kitchenconnection.org. Please include in the subject line of the email “Request to Negotiate”. Arbitration Procedures. If You and The Kitchen Connection are unable to resolve a Dispute through Informal Negotiations, either You or The Kitchen Connection may elect to have a Dispute resolved by binding arbitration by notifying the other party of such election, only if not satisfied with the remedy after informal negations are complete. YOU AND THE KITCHEN CONNECTION AGREE THAT IN THE EVENT EITHER PARTY ELECTS TO ARBITRATE, THE ARBITRATOR(S) DECISION SHALL BE BINDING. FURTHERMORE, ALL PARTIES TO THE ARBITRATION PROCEEDING AGREE AND CONSENT THAT ALL ARBITRATION PROCEEDINGS SHALL BE HELD IN HUDSON COUNTY IN THE STATE OF NEW JERSEY. You and The Kitchen Connection agree to waive the right to litigate any Dispute in court and before a jury, and agree that this Arbitration provision will be governed by the Federal Arbitration Act to the maximum extent permitted by law. You and The Kitchen Connection further agree that any arbitrator that arbitrates a Dispute under this provision is without jurisdiction to conduct a class arbitration or other representative proceeding, and may not consolidate one person’s claims with another. You and The Kitchen Connection agree that all issues of enforceability of this Agreement to Arbitrate – including issues relating to scope, validity, and unconscionability – will be decided by the arbitrator. If for any reason this Arbitration Provision is deemed inapplicable or invalid, You and The Kitchen Connection both waive, to the fullest extent allowed by law, the right to a jury trial and any claims relating to a Dispute to recover punitive or exemplary damages and any right to pursue any claims on a class or consolidated basis or in a representative capacity. The Arbitration will be commenced and conducted under the Commercial Arbitration Rules of the American Arbitration Association (“AAA”) and the AAA’s Supplementary Procedures for Consumer-Related Disputes (“AAA Consumer Procedures”), both of which are available at the AAA website, www.adr.org, or which may be acquired by calling the AAA at 1 (800) 778-7879. Any Arbitration will be confidential, and neither You nor The Kitchen Connection may disclose the existence, content, or results of any Arbitration, except as may be required by law or for purposes of enforcement of the arbitration award. Judgment on any arbitration award may be entered in any court having proper jurisdiction. If any portion of this Arbitration Provision is determined by a court or the arbitrator to be inapplicable or invalid, then the remainder shall still be given full force and effect. In all Arbitrations, each party will bear the expense of its own counsel, experts, witnesses, and preparation and presentation of evidence at the Arbitration. Any content uploaded to our site can be used to promote you and what you do on our social media. It will not be sold or disbursed to any third parties. Live video sessions that take place on Kitchen Connection may be edited and recorded and used for promotional purposes. By using the site and all of its services, you agree to these terms and conditions. Who are your sponsors and supporters? Sponsors and supporters include: Action Against Hunger, New York University Food Studies Program, The American Culinary Federation (Puerto Rico), Whole Foods Market (Bowery), World Association of Chefs Society. How do I become ‘featured’ on Kitchen Connection? Reach out support team at support@kitchenconnection.org. Make sure your profile is complete. If approved, you’ll be at the front of our platform for all to know and learn about you. Basically, you create a profile, share your food knowledge via link/picture updates, and communicate with the most expansive online food community in the world via chat or live video session. Through these live video sessions, you can share a topic to talk about or a recipe to teach with up to 5 other users. Current topics include ’Tips for traveling while being a vegetarian’ or ‘What is Tahitian Food?’ Relevant recipes include: 'How to Make Couscous’ or ‘Make a pizza like nonna with me!’ Check out our ’How it Works Video’ and our landing page for more info. Share your love of food. Meet other foodies. Promote your country through food. Stay on top of global food trends. Affiliated with any food or culinary organizations? Have this showcased on your profile. Add links to expose and promote your work or that of your organization. Make money (if you so wish to charge). Donate to our partner charity, Action Against Hunger. Search for dishes with the ingredients you have in your fridge right now. Locate your favorite foods by name or by region, if you don’t know what they’re called. Put yourself on our ‘map’ where you can see where our other Foodies are cooking today. Signing up, creating a profile, sharing and posting is free. Depending on the Cheffie, live connections can either be free or paid via PayPal. If paid, all or some of the funds can be donated to our partner charity, Action Against Hunger. 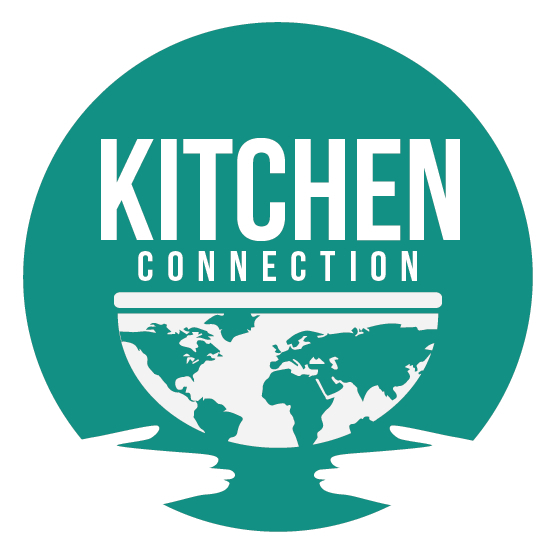 To support the platform, Kitchen Connection takes 10% of paid live video connections. You are expected to complete and update your profile, keeping the community informed with any news of your contribution to the food space. New recipe book? Share it! Discovered a new product or ingredient? Share it! Simply creating a profile enables you to be a part of the world’s most extensive online food community, from farmers to iron chefs. As much as you want! The more you share, the better your SEO rankings and the more potential customers, followers, and food lovers you attract. Do I need to be in the food industry to join? Do I need to speak a certain language or be in a certain country? No! Connect with people live from anywhere in the world, and even practice a new language! A ‘cheffie’ on our platform, is a professional or non-professional in the food world, a lover of all things food. This can be a restaurant owner, farmer, food vendor, importer, exporter, chef, home cook, culinary student, maker, crafts(wo)men, bartender, food blogger, food stylist, recipe author, cook, food association, beverage association, food media company, or fitness/nutrition expert, among others. Is this you? Join us!